The Boy/Girl Scout: Always prepared. Brings entire home office and multiple hard copies of manuscript in a rolling bag. The Minimalist: Doesn’t carry so much as a pencil. Business cards are handwritten sticky notes. The Autobiographer: Every question during Q-and-A begins with a personal anecdote. The Chameleon: Blends silently into all settings. Only visible when blinking. The Shadow: Accompanies favorite author/industry professional everywhere. Even the restroom. The “We’re not worthy!” Wayne and/or Garth: Observes any and all authors/industry professionals from a comfortable distance. The Hummingbird: Can’t stay put. Sits in on at least part of every session. The Tortoise: Comes in five minutes late. Always. The Teflon Skillet: Rejection slides right off. Hey, it’s not personal, right? The Cardiologist: Takes everything to heart. The Cinderella: Leaves early on Friday. Wonders what everyone is talking about the next morning. The Life of the Party: No Saturday breakfast, please, just coffee. Lots of coffee. The Nolan Ryan: Delivers a pitch so fast and flawless, you barely see it coming. The Tim Wakefield: The pitch is slower, it wobbles all over, but it gets there in the end. In case you think I’m being overly judgmental, rest assured that I have, at one conference or another, been almost all of the above, sometimes simultaneously. 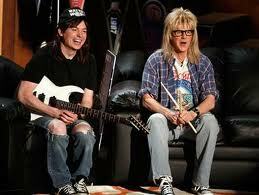 In fact, there are still some personas I have a hard time shaking off (just call me Garth the Chameleon). But I love conferences because I always meet people who inspire me, make me laugh, make me feel welcome among my peers, and, most importantly, make me want to be a better writer. Do you see yourself on this list? This is so true, I've met all of these different kinds of people before at a convention. Also, I could not stop laughing when I was reading this!!! Oh, yeah. From bringing my entire office to melting into the interior wall, been there. Makes me want to update my business cards! Great post! I'm totally Garth! For the NCW Conference I am The Hummingbird (which explains why I end up being so tired when it is over). Great post, Jenny. When I first started attending conferences I was The Chameleon, and that's the real me. However, these days I at least pretend to be The Social Butterfly (fueled by lots of caffeine). It's exhausting, though. I'll take a really long nap on Sunday. Thanks, everyone! I hope I'll have a chance to see all of your conference personas in a few days.